So I’ve been going to yoga fairly regularly for several weeks now and am getting pretty good at holding downward dog. It’s not so easy for me, since my calves are very tight and they don’t stretch so much. I’ve been engaging into my legs more, and the teachers have been pressing into my hips to push me back when I’m in down dog. It is such an awesome stretch when they do that. I really feel my calves stretching and making some progress in the pose. So since I had done so well today, mostly on my own, I thought I’d try to get a photo of how I actually look in the pose. you know, they way you actually look, and how you picture yourself in your minds eye are usually two different things. 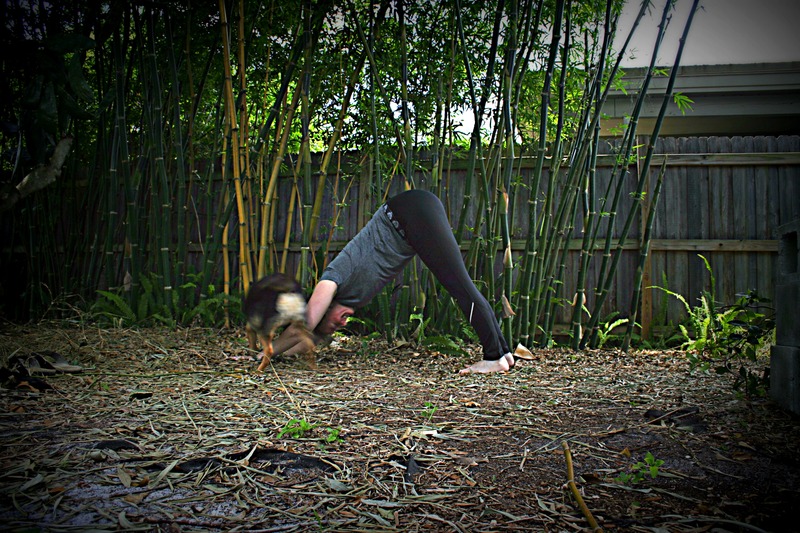 Needless to say, when I try to do any kind of exercising or yoga at home, the puppies always seem to think that this is a good time for them to kiss me, which makes it hilarious and challenging to do any kind of pose. Here, Anna has decided that my face needs cleaning. She’s such a good girl. Anyway, not a bad pose.